Rev. 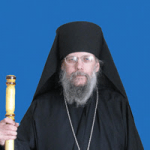 Evangelos Pepps and the board of Share the Faith Ministries This letter serves to assure you and your board that Bishop Alexander, Locum Tenens of the Diocese of the Midwest, Orthodox Church in America, grants his blessings to Fr. Evangelos Pepps and the “Share the Faith Ministry”. This includes his blessings on your efforts to raise funds for this ministry.